Airway diseases -- These diseases affect the tubes (airways) that carry oxygen and other gases into and out of the lungs. They usually cause a narrowing or blockage of the airways. Airway diseases include asthma, COPD and bronchiectasis. People with airway diseases often say they feel as if they're "trying to breathe out through a straw." Lung tissue diseases -- These diseases affect the structure of the lung tissue. Scarring or inflammation of the tissue makes the lungs unable to expand fully (restrictive lung disease). This makes it hard for the lungs to take in oxygen and release carbon dioxide. People with this type of lung disorder often say they feel as if they are "wearing a too-tight sweater or vest." As a result, they can't breathe deeply. 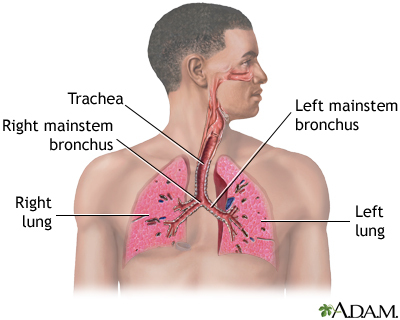 Pulmonary fibrosis and sarcoidosis are examples of lung tissue disease. Lung circulation diseases -- These diseases affect the blood vessels in the lungs. They are caused by clotting, scarring, or inflammation of the blood vessels. They affect the ability of the lungs to take up oxygen and release carbon dioxide. These diseases may also affect heart function. An example of a lung circulation disease is pulmonary hypertension. People with these conditions often feel very short of breath when they exert themselves. Many lung diseases involve a combination of these three types. How Well Are You Managing Your COPD? What's the best way to slow down lung damage due to COPD? The correct answer is stop smoking. If you have COPD, the best thing you can do for your lungs is to quit smoking. If you need help quitting, ask your doctor about quit smoking groups, medicines, and other tools that can help you kick the habit. You can avoid flare-ups at home by doing which of the following? The correct answer is all of the above. Cold air, fireplace smoke, and cigarette smoke can all trigger COPD symptoms. Avoiding triggers can help you breathe more easily and have fewer flare-ups. Ask your doctor about other ways to improve your symptoms. Men with COPD are more likely to feel depressed than women. The correct answer is false. Both men and women with COPD are at risk for depression or anxiety, but women are more likely to be depressed or anxious than men. Depression and anxiety can make your flare-ups worse. If you think you may be depressed, see your doctor. Overnight oxygen therapy can help you sleep better. The correct answer is true. About half of people with severe COPD have trouble sleeping. Overnight oxygen therapy may help with sleep problems. See your doctor if you're having trouble sleeping to be tested for low oxygen levels. The correct answer is all of the above. Pulmonary rehabilitation can help you manage your COPD better. Talk with your doctor to see if it's an option for you. Pulmonary rehabilitation can teach you a new way to breathe. The correct answer is true. You can learn a new way to breathe called pursed lip breathing. Breathing this way before you begin activities or exercise can help your lungs work better. Ask your health care provider about pursed lip breathing. Walking is the best exercise for people with emphysema. The correct answer is true. In studies, patients who exercised often were able to walk father and breathe better. Try to walk three or four times a day for 5 to 15 minutes. Flying can make breathing problems worse. The correct answer is true. If you're planning to travel by plane, talk with your doctor first. You may need to arrange for in-flight oxygen or a wheelchair. You also may need to let the airline know if you need to take certain medicines or have breathing machines on the plane. Medicines help people manage COPD, but not cure it. The correct answer is true. There are many different kinds of medicines to treat the symptoms of COPD. But they won't cure it. Medicines help people with COPD breathe better, live more fully, avoid flare-ups, and treat flare-ups when they happen. If you have any questions about your medicines, talk to your doctor. Strengthening exercises are good for people with COPD. The correct answer is true. Strengthening exercises can help build muscles and improve breathing. This type of exercise also may help you with simple activities such as standing up from a chair and climbing stairs. Talk with your doctor about what exercises you can do to build strength. This is a CT scan of the upper chest showing a mass in the right lung (seen on the left side of the picture). This picture is a chest X-ray of a person with a lung mass. This is a front view, where the lungs are the two dark areas and the heart and other structures are visible in the middle of the chest. The X-ray shows a mass in the right upper lung, indicated with the arrow (seen on the left side of the picture).